In this lesson, I’m going to introduce one and two-point linear perspective. Perspective drawing is a way for us to express a three dimensional space on a two dimensional surface. Vanishing Point(s): The point(s) where parallel lines seem to converge and disappear. To put it a different way, it’s the point or points where orthogonal lines come together. Horizon Line (aka “Eye Level Line”): This an imaginary line represents the farthest distance in the background. In perspective drawing, a horizon line is the height of the viewer’s eyes. So, when objects are centered on the horizon line, they are sitting at your eye level. If you place an object below the horizon line, the viewer will be looking down at the object, while placing an object above the horizon line gives the illusion that it is floating above the viewer’s head. Orthogonal Lines: Imaginary diagonal lines that are parallel to the ground plane and radiate from or converge to the vanishing point(s). They act as guidelines to help you maintain perspective while constructing a three dimensional scene. Transversal Lines: These lines are parallel to the picture plane. They connect orthogonal lines at right angles, establishing an object’s fixed width or height. One-point perspective is the easiest to learn because there is only one vanishing point. In the image below, all the perspective lines in the scene originate from a singular vanishing point on the horizon line. 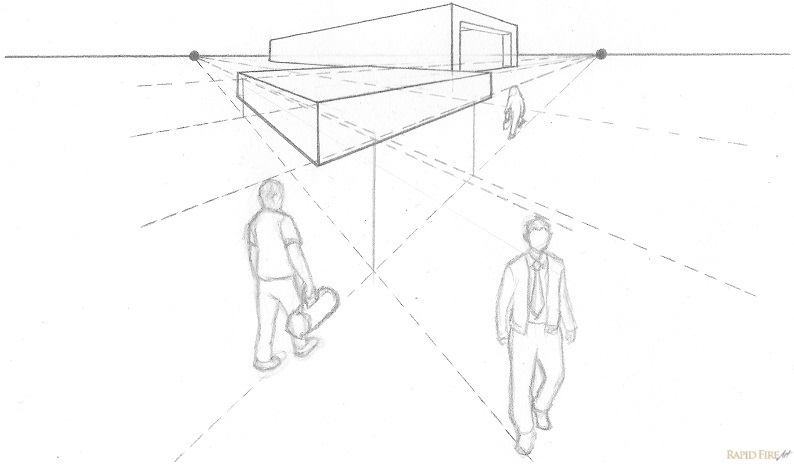 One point perspective is appropriate when drawing subjects that are facing you directly, instead of at an angle. This method is a really popular for drawing interior spaces – like the example you’re about to see below. In this step by step mini tutorial, I’m going to draw a room with several people in it. Use a ruler to draw a straight horizon line with a vanishing point that you can see clearly. Let’s start with the wall that’s facing us directly. Use your ruler to draw a rectangle (transversal lines). Make sure the vanishing point is somewhere inside of it. If the vanishing point is outside of the rectangle and the rest of the room is drawn, we — as viewers — will be looking at the room from the outside. Use the ruler to align the vanishing point to one corner of the rectangle. Draw a very light orthogonal line that stretches far past that corner. Do this for the other 3 corners of the rectangle. Now that your orthogonal lines are in place, draw solid lines to complete the structure. You can add things like tables and chairs or even doorways into the scene. For this example, I’m going to keep things fairly simple. So let’s put a glass panel on the left wall to turn this room into an aquarium. Start by drawing a set of orthogonal lines on the left wall of the room. Add two transversal lines (or dotted lines if you’re not sure exactly what size you want it to be just yet). Once you’re confident with the shape and size of the glass panel, draw solid lines to define the new object within the room. Add a big sea creature into the tank! Draw Person #1: I’m calling him Gary… for short. To do that, draw 2 orthogonal lines. The top one will define his height and the bottom one will define how far from the wall he will be standing (look at the distance from the bottom orthogonal line to the edge of the wall). Make sure your bottom line isn’t too close to the wall or else poor Gary will be flat against it. Then, draw a straight transversal line to define exactly where he’s going to stand. Now all you have to do is draw Gary! Draw Person #2: Her name shall be Lisa. Let’s draw her along the exact same orthogonal line as Gary. Since those lines have already been defined, all I have to do now is add a transversal line to define where Lisa will stand. Tip: If you want Lisa and Gary to have the same body proportions like the same head size or waist height, draw an orthogonal line under his chin and another one through his waist. When you draw Lisa, just make sure her chin rests on the first line and her waist intersects with the second line. It’s getting a little crowded on the right side of the room, so let’s fill the rest of the aquarium while keeping everyone’s height the same. To do that, use a ruler to draw a dotted horizontal line from the top of Lisa’s head and the bottom of her foot to the far left side of the room. Then draw a vertical line where you want Pete to be positioned. You’ve probably gotten the hang of it by now! But let’s draw one more person. Tom is going to be standing in the middle of the room. To make sure he doesn’t block Gary or Lisa’s view (they’re really enjoying the sharks by the way), draw a transversal line in between Lisa and Gary. Remember the technique you used to draw Pete? Use the same one here. Now they can all enjoy the show. In two-point perspective, there are 2 vanishing points. A single object can be drawn using reference lines coming from both points. Here, every edge of the shape except for vertical edges can be found by using perspective lines. In this example, I’m going to draw two structures and five people. Use a ruler to draw a straight horizon line and two dots placed well apart. Start by drawing a small vertical line between the two vanishing points. The length of this line will determine the height of your structure. From each vanishing point, draw 2 perspective lines. Each line must touch the top and bottom of the vertical (transversal) line you just drew). Between each set of perspective lines, draw another transversal line. Now the structure has 3 edges. The new transversal lines need to be connected to both vanishing points. So draw two additional sets of orthogonal lines to connect them. Those orthogonal lines were used to help you form the unknown sides of the structure. Now that you have a nice set of guidelines, use solid lines to define the shape. Use the same steps to draw a second structure somewhere in the distance. If you want to add people, draw a vertical line to represent the average height for each person. It can go anywhere you want. Once you have that in place, draw orthogonal lines coming from each vanishing point. They should touch the top and bottom of the vertical line. 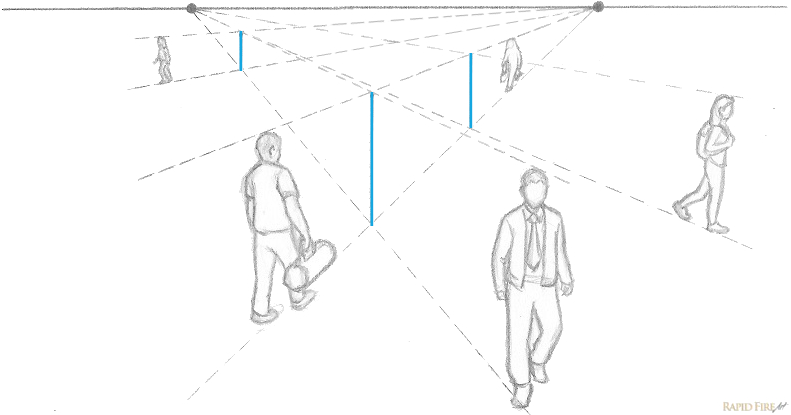 Draw people walking along the dotted perspective lines. To add more people in other areas of the drawing, employ the same method mentioned in the section on one-point perspective, above. Let’s say you went out for a walk at lunchtime and came across a beautiful cityscape you badly wanted to capture in your sketchbook. With only 25 minutes left to spare, you struggle to measure and draw all 38 buildings and 15 lamp posts in the scene in front of you. Was that enough time to get the job done? Perhaps the better question is: Was that the right technique to get the job done? In lesson 4, I covered measuring techniques – and although they’re great to use on several objects or individuals in the same scene, it’s very tedious for something such as a crowded street or a railway with six train tracks. If you can find the horizon line and vanishing point(s) in an existing scene, it will reduce the amount of guesswork and measuring greatly. Here’s a large L-shaped building. Without scrolling down, can you find the vanishing point and horizon line? You can find the vanishing point of a scene by tracing your way back to its origin using orthogonal lines. Draw a straight line against every side edge of the building. Where each orthogonal line intersects, you have your vanishing point. To find the horizon line, look at the building’s horizontal edges. Why is it important to find the horizon line? When it comes to one-point perspective, the horizon line helps you know which angle to draw certain edges of a building or objects within a space. For example: not all photographs are perfectly level, so it’s common to come across a reference image that is tilted/slanted. Can you find the vanishing points and horizon line for the image above without scrolling down for the answer? Draw perspective lines along the edges of each shape until they intersect/converge. You should end up with 2 vanishing points. To find the horizon line, simply connect both vanishing points together using a straight line. Here’s your homework and challenge rolled up into one assignment! What does that mean? If you complete the assignment from this lesson and post it on the RFA facebook page, I’ll share your artwork with everyone by posting it below (along with a link to your facebook page). Find a room in your house or an outdoor space with buildings, structures and/or people and draw it using linear perspective. The more detail the better! I can’t wait to see what you guys will draw! I’m going to submit my left handed homework too… as soon as I finish the assignments from lesson 4 and 5 haha. I’m a slacker. If you’re done the assignment and are waiting for lesson 7, sign up to my mailing list over on the right to get updated when a new lesson comes out. UPDATE: Lesson 7 is fresh out of the oven. Click here to continue learning! If you love what I do here on RapidFireArt, come visit my Patreon page where you can support me while earning cool rewards at the same time! I love your blog! I was looking for a course. I am a half starter…I will explain. I always loved drawing. I was looking for courses online because where I live is hard to find drawing courses. I learned some stuff, but it only helped me start. I searched through websites, Google, until one day I saw your website, I read your content, AND I LOVED IT! I have learned a lot of things with your lessons and tutorials. Thanks Darlene!